Released late in 2014, iPhone 6 and 6 Plus gained popularity around the world due to unique design and its high performance. However, Apple cannot satisfy consumers with just the iPhone. There are many accessories being created to fulfill what Apple has been missing. Below are the top 10 iPhone 6 and 6 Plus accessories. Gotida offers its best case cover for your high-end iPhone 6 and 6 plus. First, the case is made of synthetic leather that is cut into a perfect fit for your iPhone. The case cover, moreover, protects your iPhone from any unintentional bumps or scratches. If you are worried that the case makes your iPhone look thick and heavy, don’t. It is, however, specifically designed to make your iPhone look thin and stylish. It comes with different colors. New Trent Trentium 6L Protective Durable TPU Case is ideal for your iPhone 6 plus. To begin with, it is made from material that is durable and can protect your iPhone from any outside damages. Moreover, the case has a slim design that is perfect for you iPhone. Finally, it comes with three different colors for you to use interchangeably: black, silver, and gold. If you want to cover only the screen of your iPhone and leave the other gorgeous design of your iPhone, this is the one. Beluga offers the cover that covers only edge to edge of your screen. 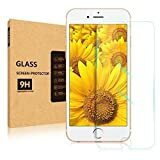 This screen protector has high response and provide original transparency of your iPhone. In addition, it is made to resist any scratches up to 9H which is stronger than a knife. It is coated with oleophobic for fingerprints and smudge proof. By Smartphoneaides, the Best USB Car Charger is perfect for you if you want to charge your iPhone on your car conveniently. One of its main feature is that the charger will stop charging your iPhone when it is full. Moreover, due to the fact that the charger is made of high grade anti-oxidized aluminum and premium fireproof material, it will not get hot even if you use it for a long period of time. Finally, you can have your money back if you feel unsatisfied with the product. It is ideal for iPhone 6, 6 plus and other devices as well. Spartanfive Sports Armband is designed for Apple users who like to do sports. The armband is equipped with neoprene material which makes the armband light and bendable. 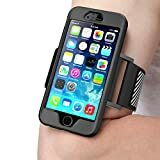 Importantly, you do not need to take the existing case off because the armband has a see-through cover that can keep your screen protected against scratches and moisture. 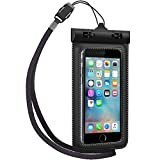 It is ideal for iPhone 6 and iPod Touch 5.
iPhone 6 Plus Armband by Supcase is made of high material to provide comfort and maintain your connectivity to the world. The armband has silicone skin to protect your iPhone while you are doing your exercises. Moreover, the armband is designed to make it easy for you to insert and remove your iPhone quickly. Last but not least, it is easy to wash.
Have you ever worried that your iPhone might get wet during rain or sometimes during your work if your work is involved with water and it will get malfunction? With Ultraproof Waterproof Pouch, you need not worry anymore. The pouch is made of a durable thermoplastic polyurethane material that could resist dirt, bumps, water, grease and scratches. In addition, the pouch has a lock that allows you to open or seal conveniently. Last but not least, the pouch is so transparent that allows you to access and control your iPhone access from outside of the pouch. It is ideal for iPhone 6 and other devices with the same size. By i-Blason, this model is one of most popular products among its kinds. The battery case has large better capacity, up to 4700 mAh to recharge you iPhone. Not only is it useful, it has an elegant design that can protect your iPhone as well. Furthermore, the case has Built-in LED Indicator that will indicate the remaining power. 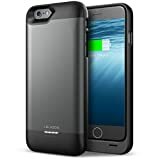 Importantly, to facilitate the charging process, the Battery Case comes with a lightening connector to charge your iPhone and a USB port to charge the battery case. It is designed only for iPhone 6 plus only. Are you looking just a simple, clear case cover for your iPhone? Here is one for you. 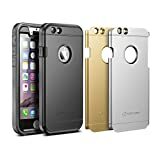 Clear iPhone 6 Case by Tummah LLC has clear, transparent cover that highlights the elegant design of your iPhone. The case is made from thermoplastic polyurethane that is soft to touch and can protect your iPhone from external damages. Last but not least, you can get your money back if you feel unsatisfied with the product. It is ideal for iPhone 6. The last product is the iPhone 6 Screen Protector by Aerb. The screen protector is made of nano-chemical materials that contain many features. The screen, first of all, is HD ultra-clear that provides high sensitivity to your phone. Moreover, the screen is fingerprint, shatter, and scratch proof. With these qualities, you can feel safe that your expensive iPhone is fully protected. The product is ideal for iPhone 6.